Monday 28th May 2018 🌧️ ⛅🌧️ ⛅🌧️ 🌞☁ and that about sums up the day!! Mileage today 98 from Kerteminde on Funen to Roskilde on Sealand. Well, I think I'll have to start this story by telling you about the horrendous ⛈️ thunderstorms ⛈️ we had yesterday afternoon ⛈️ and evening. During the worst of it the noise of the rain pounding down on T4rdis2's exterior was so loud that the only way to communicate with each other was by sign language (but that's not unusual), and every time we thought it was going to stop another deluge hit us. But hey ho, no harm was done and that was the first lot of proper rain we've seen since leaving England nearly 3 weeks ago. This morning we left Kerteminde and headed for the bridge that crosses from Funen to Sealand which is Denmark's 3rd largest island. We already knew that to cross we'd need to pay a toll (365kr or about £43 equivalent), and we were anticipating quite a spectacular structure - and we weren't disappointed. The bridge is 18 kilometres long (11 miles) and crosses The Great Belt which is the body of water that connects the Baltic sea to the North Sea, and unsurprisingly it's known as The Great Belt Bridge. However, it isn't really just one bridge - Wiki explained that it's a multi element fixed crossing that consists of 5 structures, the main one being the suspension part that occurs about half way along it's length. That part also holds the accolade of being the world's third longest main span (1.6 km) and the longest outside of Asia. The bridge eventually replaced the ferry service in 1998, but it was a long time in coming because work on it had initially commenced 12 year earlier, and the cost - well that was a cool 21.4 Billion Danish Krona - and that was at 1988 prices! Altogether it only took about 10 minuets to cross, and then once we were on the Sealand side we set Mrs Snoopy for our first port of call which was the Trelleborg Viking Ring Fortress. This was a place that we felt quite compelled to visit because so far while we've been in Denmark we've done nothing that has been connected to the countries Viking heritage. However, despite the fact that the museum was closed (always is on Monday) the grounds were left open, so really that suited us just fine. Our visit was really quite interesting and while we were there we learnt that the site dated back to around 980AD and that this fort was likely to have been built by King Harold Bluetooth - apparently he's the chap who inspired the name for today's modern wireless technology!! Beside the remains of the ring fort we also got to see a reconstructed longhouse that was built in 1942 - but it must have been a bit gloomy inside because there were no windows! Apparently inside the ring fort there would have been sixteen of these built in a symmetrical pattern, but additionally, there were also homes outside the fortress and these were also available for us to see. After we'd seen all that was on offer it was coffee time, and then forwards and onwards to our next destination which was a campsite just outside the town of Roskilde and right on the edge of a massive body of water which is Roskilde Fjord. The site is said to be one of the most beautiful campsites in Denmark, and from our new position on a sloping field that overlooks the fjord we wouldn't disagree! But we do have a bit of a problem - when we arrived we were made very welcome and given a whole heap of info, not only about the surrounding area and things to do, but also about what is called The Danish Riviera - that is the Northern part of Sealand. There's no way we can fit everything we'd like to into the short time we'd planned to stay in Denmark so therefore it seems we might be here slightly longer than we originally thought! Tuesday 29th May 2018 🌞🌞🌞🌞🌞🌞 - another hot one! About 10 walking miles today! 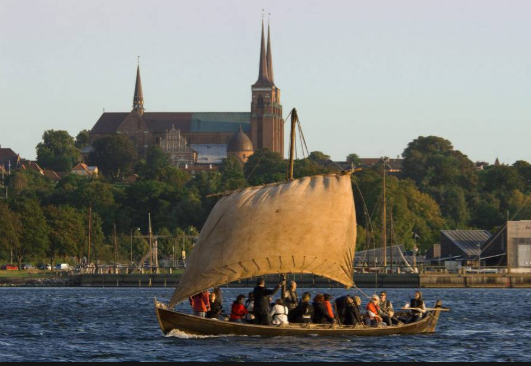 Initially our plan for today was to visit Roskilde's Viking Museum, and after that we thought we might have a toddle around the town's UNESCO listed Cathedral. However, there were a couple of factors that made us think twice about if the museum would suit us very much! The first was Julie's sentiments from (Our Tour) - she commented 'I wasn't particularly overwhelmed by the boats', but after that she does give an excellent description of what you can expect to find there! And the other thing that put us off a bit was the price - 130 DK or a little over £15 each. But having said all that we decided to go and have a look anyway, so we strolled the 2 and a bit miles to the site and then nipped into the building's reception - but once there we very quickly decided it wasn't for us and kept our dosh in our pockets because although we couldn't actually see the renovated boats we could stroll along the public precinct that passes right through the old boat yard where a lot of work was being carried out as it would have been in times gone by. 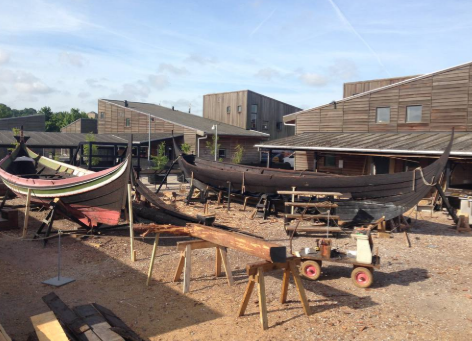 The boats contained within the museum are original Viking Ships that had been purposefully sunk at the mouth of the Fjord to form a barrier to prevent invasion and thus to protect the town of Roskilde. They are apparently nearly a 1000 years old and were discovered back in 1962, but since then more have 'surfaced', so with those and the 'new' replicas that are being produced in the boat yard the fleet is ever growing. All the work seemed to be being done using original tools. From the boatyard it was also possible to hitch a ride in one of the replica boats - for a price of course! Our next target was Roskilde's Cathedral with dominates the sky line over the city - and even though we're not in any way religious we do quite enjoy seeing such buildings because of their wonderful architecture and the mesmerising artefacts that are usually contained within - and this one didn't disappoint. For our 40 Kr each (senior rate😂) we were given an English guide book that explained that there had been churches on the site for more than 1000 years, and it's thought that the first one was built by Harold Bluetooth who died around 985 and may have been buried here. Furthermore, it also provides a final resting place to no more than 39 other royals, and apparently that's a record world wide. The present brick church was started in 1170 but it's construction lasted for more than 100 years, but even after that lots of further extensions were made to add new chapels and burial chambers, the most recent being for King Frederick in 1985.
used on special occasions today. Once inside there were literally hundreds of things we could have photographed but pics just can't convey the grandeur of the treasures on display so therefore, I'll limit myself to just a few! 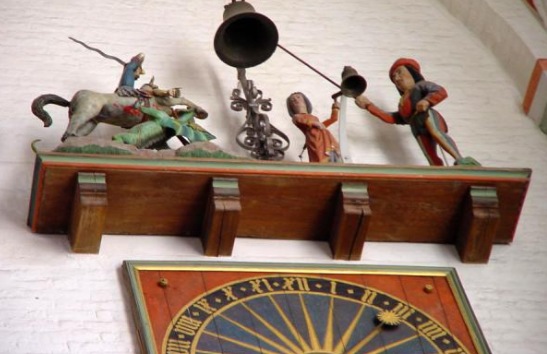 The Clock is from the 1400s and each hour Saint George kills the dragon which lets out a frightful wail! Then after our visit was complete the next item on our agenda was to find a quite shady spot for our picnic lunch, and after that came a short exploration of the main shopping streets within Roskilde before we started our trek home! We reckon we might have covered about 10 miles altogether so as you would imagine we were a bit weary by the time we got back to the baking hot confines of T4rdis2! But once doors and windows had been flung open to allow a cooling breeze to flow through the van we spent a very pleasant late afternoon just chilling, and I must admit we did indulge in another cold beer as we whiled away our time. This morning we set off on a bike ride that would take us down by Roskilde fjords waterside, through thick woodland, through several small villages, and we thought past a micro brewery were we planned to stop and taste their wares - however, that bit of our ride was a disappointment because it appeared to have closed down! We stopped in the woods when we found a wild camp site - certainly not for motorhomes - just somewhere to stop with your sleeping bag for the night while you sucked in the wonderful surroundings - and it was even complete with a 🚾 🚽 - but not of the flushing kind! The camping shelter is at the back! After that the only problem with our outing was it was fairly hard to find another delectable place for our feeding stop, but at about mile 16 one popped up and it was really just like a picture postcard village green complete with thatched cottages, lily pond and ducks who quickly asked to share our picnic. Then after lunch we stopped at Netto for a bit of restocking, before heading back towards Roskilde where we were rewarded with not only views of the Cathedral's 3 spires but also with the pointed chimney of the towns power plant. This extraordinary building was built amongst a lot of controversy with the locals, but since it's construction it has been awarded numerous accolades for it's uniqueness. It has a 98 metre tower that comes to life at night because the whole thing has perforations that have interchanging light patterns which are described as transforming it into a lighthouse of colour. 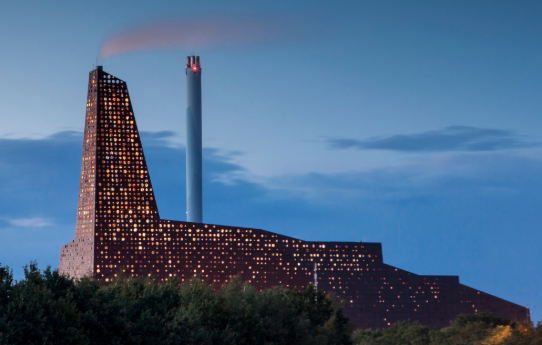 However, it isn't just pretty - it also supplies 65,000 households with carbon neutral power and 40,000 more with heat. Then after that we didn't have much further to go until our ride was complete - but in today's heat our early finish was a good thing. Tomorrow we'll move on again, so our next episode will come from wherever our next destination is! !